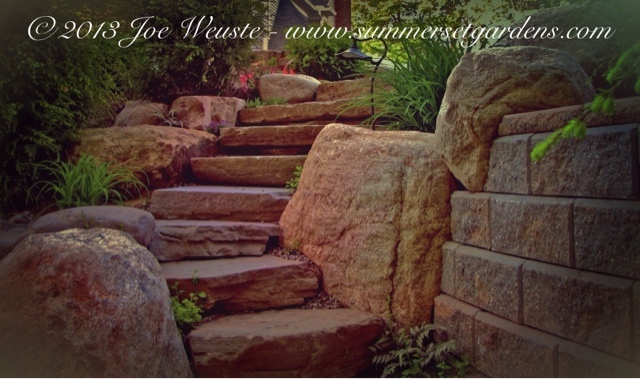 These stone garden steps are hidden behind a swimming pool waterfall. They lead down to the pool equipment that I have tucked away behind some retaining walls. The space is planted heavily to add additional screening. Boulders have been carefully placed along the steps. You can see one of several path lights that I have place along the steps. The waterfalls, plantings and retaining walls help to deflect the noise from the pool equipment. Landscape, garden, masonry, swimming pool design and construction services in the NJ and NY areas.